At The Tree Center we think all trees are interesting, but we have to admit that some go beyond that into the territory of absolutely fascinating. A classic example of those are ficus trees. As well as being popular for both fruit and ornamentation these plants show enormous diversity and some unique biological features. You’ll see ficus trees at just about any garden center, because they’re commonly grown as houseplants. The little specimens you see in pots aren’t all there is to ficus though. The name actually refers to a genus, which contains about 850 different species. The one usually sold as ficus is Ficus benjamina, also known as the Weeping Fig. In the wild this is a large tree that can reach a hundred feet tall, but it adapts well to indoor life. Its versatility sums up the whole family, too. Ficus is the common name for the weeping fig, but fig is the common name for the ficus genus. They’re mostly tropical evergreens but there are a few deciduous species that extend north and south into warm temperate zones. Fig trees can be found in both the Old and New Worlds and they appear in a bewildering variety of forms. Most are trees, covering a wide range of sizes with the largest ones living in rain forests. Others are smaller shrubs. Then there are vines, including the notorious “strangler figs”. These germinate in a crevice or hollow in the branches of another tree, sending branches up to catch the sunlight while their roots grow down the trunk of their host to the ground. Eventually the roots envelop the host, which often dies. When it rots away the result is a hollow lattice supporting the crown of the strangler fig. Humans have been cultivating ficus for their fruit since at least the Bronze Age; the trees are mentioned several times in the Bible, including their leaves being used by Adam and Eve when they realized they were naked. They also appear in the books of several other religions and in some places were often planted near temples. Buddha supposedly found enlightenment underneath one. But while the fig was important for religious reasons its real value lay in its fruit. The fig’s fruit has been valued for centuries, both as a food and in traditional medicine. It’s also very interesting to biologists because it’s a fascinating example of evolution in action. The fruit itself is very unusual. It looks normal enough from the outside, with a smooth skin, but it’s anything but. In fact it’s a multiple fruit like a mulberry or pineapple, formed from hundreds of tiny flowers, but it’s inside out. When a fruit begins to develop the tree produces a hollow shell with the flowers on the inside, and a tiny hole at one end. The Chinese name for figs means “fruit without flower” but the flowers are there – they’re just invisible. Unless you’re a fig wasp, of course. Fig wasps are tiny flying insects that feed on the pollen of fig flowers, and the hole at the end of the hell is there to let them in. As they feed the wasps carry pollen from male fruits to female ones, and eventually lay their eggs inside one. When the young wasps hatch they mate then tunnel their way to freedom, leaving the fertilized fig to ripen. What makes this process so interesting is that, with very few exceptions, each species of fig is fertilized by its own unique species of fig wasp. If you grow a ficus tree at home it’s not likely to produce fruit unless you happen to have the right species of fig wasp in the area, so while the flower cases will appear they’ll never ripen into edible figs. This species isn’t often grown for its fruit anyway – most fruit comes from the Common Fig, Ficus carica. Instead ficus trees are prized for their appearance, with elegantly drooping branches and bright green foliage. There are cultivars with color variations including some that have variegated leaves; a popular one is Starlight. 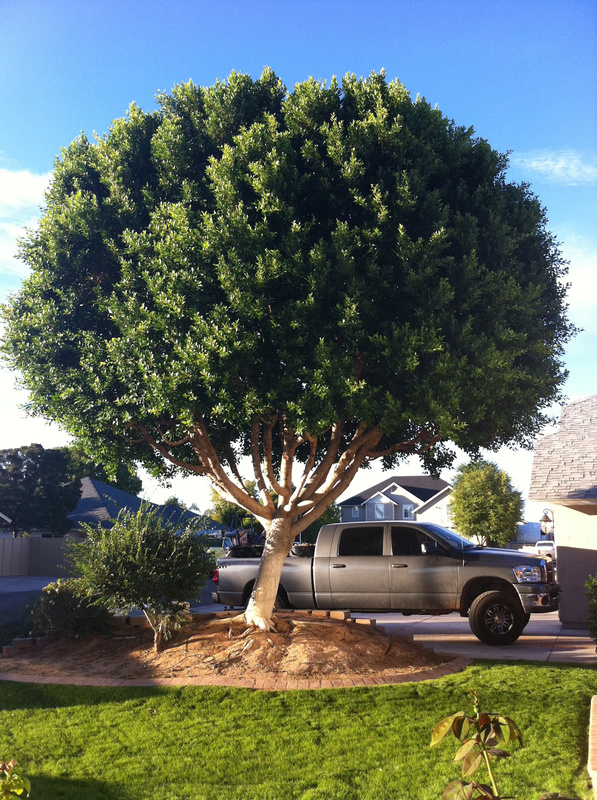 Ficus can grow rapidly, and the roots of a large tree could cause havoc with your driveway, patio or even foundations. The US Forest Service recommend that if you plant them outdoors they should only be used as a hedge or screen, and regularly pruned to keep their size manageable. They’re sensitive to cold though, and won’t survive winter outdoors in most of the continental USA. It’s hardy in USDA zones 10 and 11, so if you don’t live in one of the warmer areas you’re limited to growing it indoors. Luckily that’s not difficult. The main challenge to growing a ficus is their rapid growth. Repot every other year to slow them down a bit, and be prepared to prune regularly. They appreciate bright light but where possible keep them out of direct sun. In summer you can move it outside but again look for dappled shade or partial sun, as the leaves can burn in strong sunlight. You’ll find that the leaves are very sensitive to light levels; if you turn a ficus it will often shed most of its leaves and grow a new set that are adjusted to the new pattern of light and shade. Try to keep them out of cold drafts, too – that can cause loss of leaves. Your ficus likes some humidity, but not wet soil, so misting can be a big help. Don’t let the root ball dry out but ensure the base of the pot is well drained and the roots aren’t sitting in water. Because of their speed of growth ficus go through nutrients rapidly, so add some slow-release fertilizer in late spring. Healthy ficus are quite resistant to pests but if stressed they become more vulnerable. Incorrect watering, drafts, too little light or a dry atmosphere can stress them, and that’s when they might pick up an infestation. The most common pests are scale, spider mites and mealybugs. If they appear kill them with neem oil. 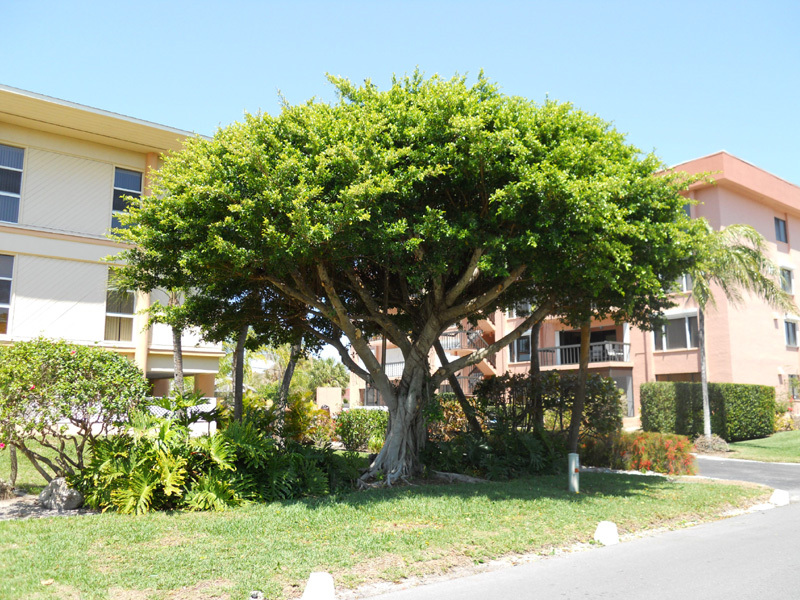 One attraction of the ficus is that it always maintains a classic tree shape, with a single trunk and spreading branches, no matter what size it is. That means it can be pruned and managed to fit any available space, but it also makes it ideal for bonsai; in fact it’s one of the most popular choices for indoor bonsai in the USA. If you’re looking for an introduction to the art a ficus is perfect; the growth rate gives you plenty practice in the techniques, but at the end of the day the tree adapts to it well. Hopefully you now see why we find the ficus so interesting, and if you don’t have one yourself we really recommend you get one. Whether you let it grow into a giant that dominates your hall, or shape it into a delicate bonsai, it will be an attractive addition to your home.